The aluminum extruded main rail utilizes the industry standard 10-series T-slot mounts that readily accept accessory mounting hardware to carry gear such as a shovel, axe, or recovery jack. The optional JKU 4-Door 6-Piece Cargo Slat Kit (sold separately # 4722050 or # 4722060) provides a platform to hold gear and allows direct mounting of popular sport equipment carriers without need for a load or crossbar. • Optional 6-Piece Cargo Slat Kit (# 4722050 or # 4722060) sold separately for additional mounting options. Liking it a lot so far, however had a few issues that I'm offering some suggestion on... I seem to have that one jeep with a ever so slightly higher than the norm safety cage. Instead of needing to shim up, I actually had to remove just a little material from the bottom of each foot on the interior with a belt sander. (Palm sander might work too I guess) I assume most would need to shim up a 16th or so, where as I had to remove a little more than a 1/16 to get the brackets to sit flat after chasing the alignment of the holes for a while. Might seem like a small amount, but makes for a tensioned fit on all other OEM fasteners on the roof. As mentioned mine is likely an odd bird or off day at the factory - but an added tidbit in the instruction sheet could help those who scratch the head on that one. As it becomes obvious when the front Fiberglas tabs at fasteners on the roof at the driver and passenger front doors sit high, and the rear brackets hard to keep aligned when tightened down - with no shims... In fact if you can slide a shim under the roof at the tub, that's about the amount you sand off the foot/feet. Once done, works like a charm! This one might be for the nit picky.... The captive nuts in the bracket with the roof off jingle a little when driving with the roof off... Think if I had the roof off for a while - might stick the roof screws in them, just to stop the jingle... Realize they have to be loose for shift in measurement and general application of the roof, but a means to silence them is hand readily. (Rock solid with the roof on BTW) Otherwise, performs as advertised, looks good, and not a goofy looking exo-cage of a rack. This is an extremely well-engineered solution. Fitment is excellent. This is the roof rack that should come from the factory. I only got the rails, but intend to add the slats in the near future. I use the rails as an anchor to hoist the hardtop on my Wrangler Unlimited. I use a Racor heavy lift hoist, which lifts from 4 corners instead of precariously balancing your hardtop from a single point with a half-gallon of water dangling from the other end. (Lange owners, you know what I'm talking about.) I cover the rails with pipe insulation, use Velcro straps to hold on the insulation, and then lower the hoist into place. I use ratchet straps to hold the rails to the hoist tray. Then I put my Freedom Panels on top of the tray. I did a lot of research - this is a perfect solution. The Nebo rack is exactly what I needed - both on the trail and in my garage. Installation is tricky, but only because some of the bolts are in really tight places. But that's because the brackets have to be so low-profile to fit under the hardtop. 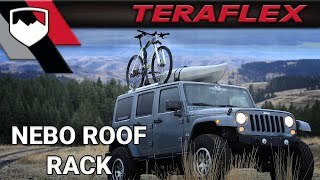 Teraflex has a great installation video on YouTube. The instructions it comes with are ok, but the video was a lifesaver. Installation is also tricky when you're a one-man show. Having a someone to help would have been, well, helpful. Cons: Teraflex really needs to improve their packaging. Every single bracket had paint chipped off. Simply wrapping them in a thin layer of foam sheeting doesn't cut it. For the price you're paying it seems packaging could be much better. Also, as another reviewer mentioned, the captured nuts in the brackets rattle a little bit. I plan on getting some knobs with matching thread to screw into the nuts when the top is off to reduce the noise. Also note that if you have the sound deadeners in your hardtop, you'll have to cut out spots for the interior landing pads to fit into. Not a big deal at all. I drilled the holes in the top per the instructions, then held the inner pads in place and used them as a template to make the cutouts. Bottom line: I think it's a really great item - something that should come on new Jeeps. I just wish my brackets weren't banged up. Had this modified to fit on my 2 door Jk. I love this rack! They were able to put 3 slats and it looks great! Very durable and I barely notice its there! Best low-profile rack available. Took me the better part of a day to install it by myself with the wife helping me take the top off and on. The install video is great to follow along, but you also need the paper instructions to identify the correct parts in the right location. One issue I ran into with the mounting blocks that go between the main rails and roof at the front. There is supposed to be a left and a right, but my kit had two lefts and no right. I used the extra left on the right side anyway and it seemed to work OK. But I was pretty upset when I realized I didn't have the correct parts that the instructions called for. Being a Saturday, I couldn't call Teraflex. Other than that, it went together great and is excellent quality. I installed the slat kit as well, and there is some added wind noise at highway speeds. Let me start by saying I've owned over 25 jeeps since 1972 and I've built up all of them for moderate Jeeping. I that time I've installed roof racks on 4 of them to primarily carry a roof top tent. All of them had exo type cages that ran down the windshield and along the back of the roof to the bumper/frame to install. My last on on my 07 JK weighed in at about 200lbs empty. This time I wanted something lighter and more streamlined looking. In my search I found at least three brands that were aluminum and required drilling thru the roof. 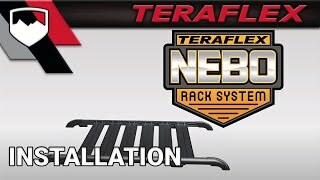 Looking a instruction manuals and videos, I chose the TeraFlex Nebo for several reasons among those the reputation for quality and customer service they have. The other reason is that the TeraFlex seems to have a higher weight capacity rating and I think that is due primarily due to what appears to have a much stronger mounting system. I was a little apprehensive due to having to drill holes in my roof but after using the drill template they provide ( the others do not ) I became very confident. In fact the template resulted in the perfect placing of the 16 holes you have to drill in the roof. The engineering and design of this system in impressive and if you take a look at the rear brackets compared to what the competition offers, you'll agree too that this is a better solution to carry a 150+ pound roof top tent. The 50 or so lbs this rack weighs keeps your weight down over a "standard" steel rack, as much as 75% less weight. Now if you are going to install this, I would have to say that it is not a one man job. Three of us did this from start to finish in about three hours. If we were to do it a 2nd time, I think we could do it in four hours. The TeraFlex install video really helps and was another reason I went with this rack. I would not call the install difficult but it is somewhat technical. It takes someone who knows their way around typical hand tools and has some mechanical ability and confidence. It takes as least two people if for no other reason that it takes two to remove the top and you can do it in maybe half the time with one working on one side, one working on the other. The final product does not leak as I tested it going thru an automatic car wash 3 times now and a heavy evening thunderstorm. If you are looking for a roof rack that is factory looking and can carry just about everything you might want to carry on top, this is the rack for you !